In New York this week the United Nations is hosting the Commission on Population and Development, an annual weeklong conference. In the face of the planet’s ever-booming population growth, and the fact that 90 percent of the world’s 1.8 billion youth live in developing countries, this year’s focus is on youth and adolescents. On the other side of the world yesterday, in villages across India teenage girls were married off en masse on the auspicious occasion of Akshaya Tritiya. The birthday of an incarnation of Vishnu, one of Hinduism’s most important gods, Akshaya Tritiya is considered an auspicious day for beginnings, and marriages are widespread on the holy day. In a report released in line with the conference, the UN secretary-general highlighted child marriage as an assault on young women’s rights in itself, and also as a cause of further rights infringements, including the right to education and to health. 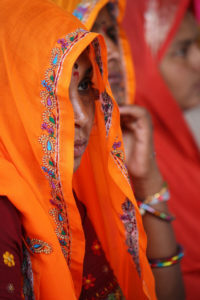 Thirty percent of women age 15-19 in least developed countries are married, and 40 percent of child marriages are said to happen in India. The legal age of marriage in India is technically 18, but in remote villages the law is unenforced and social inertia holds sway. Poverty also holds families in a cycle of early marriage. The dowry system, while technically banned, is still widespread. If girls gain social capital by staying in school, they are socially obliged to marry someone of equal or higher standing and the dowry demanded by the families of educated grooms are often beyond the means of low-class Indian families. So a family investing in their daughter’s education is often investing in their own financial downfall. Furthermore, when a daughter marries she takes her skills to her groom’s family, so if her studies earn her higher pay her earnings will solely benefit her husband’s family. There is little incentive, and heavy disincentives for impoverished Indian families to educate their daughters. The dowry issue is just one example of the deep social trends causing the continuation of child marriage. It is just one example of the engrained local practices that color the lives of international youth being discussed in broad brush strokes this week in New York.